Fourth Row Center: Film Writings by Jason Bailey: On DVD: "Rifftrax: Swing Parade"
The trio adds some big laughs (and a few good groans) to the minor musical-comedy, but it doesn’t provide the same kind of fertile comic fodder as true stinkers like Reefer Madness and Plan 9 From Outer Space. This has been a conundrum of their website recently; while they’ve taken on modern clunkers like Twilight and Transformers, they’re also riffing respected movies like Jaws, Star Wars, and even Casablanca. Swing Parade isn’t nearly up to those standards, but it’s no The Happening, either; it’s a semi-charming backstage musical, and (most damagingly to the Riffers), it doesn’t take itself all that seriously. Its primary offense, according to Mike, Kevin, and Bill, appears to be that there is, in fact, no swing parade in it; the moment the credits end, they snap “Where the hell’s the swing parade? !” and “Stop wasting my time!” The story is featherweight fluff, telling the tale of Carol Lawrence (Gale Storm, TV’s “My Little Margie”), a struggling young singer who dreams only of stardom. She can’t get an audition and is a month late (a whole fifty dollars!) on the rent, so she takes a secretary job that somehow hinges on her ability to deliver a cease-and-desist notice to the owner of a new night club where she couldn’t get an audition because, ha ha, they thought she was a process server. At any rate, this time she gets that audition, and of course she wows them (Mike quips, “As legend has it, this is exactly how it all started for Larry the Cable Guy”), and falls for Danny, the owner (a dull-as-toast Phil Regan), but of course her original intentions become known, and no points for guessing if everything works itself out in the end. Larry, Moe, and Curly appear as waiter/plumber/dishwashers for the club, as well as (in fine Marx Brothers form) matchmakers for the romantic leads (“If you are planning on holding a swing parade,” Mike notes, “please make sure you invite a minimum of two stooges”). There is so surprisingly little of their trademark roughhouse slapstick—Curly had recently suffered from a series of minor strokes, so there’s a few hits and pokes (“Ah, there’s no circumstance that can’t be made better by hitting Curly in the face”) and a mildly funny scene with the pipes below the club (lifted somewhat from their 1940 short A Plumbing We Will Go), but most of their scenes are comparatively restrained. The Rifftrax guys get off their best lines at the expense of the (often goofy) songs and dance numbers. The great Louis Jordan does a nonsensical song advising the listener not to worry about his or her mule; they get some mileage out of that one. When a number begins with a ridiculously wide shot of the entire stage (and much of the club), Kevin notes, “I guess the cameraman got the last available seat in the house.” One singer is uproariously referred to as “the 1940s version of Crispin Glover,” while the somewhat elaborate costuming and staging of the nightclub numbers prompts a very funny running joke about the number of drinks they’d have to sell to cover the floor show. That floor show pretty much takes over the third act (“Swing parade? Any time now?”), and that’s where the biggest laughs come here—a contrast to some of the weaker Rifftrax, which frequently start strong but sputter towards the finish. 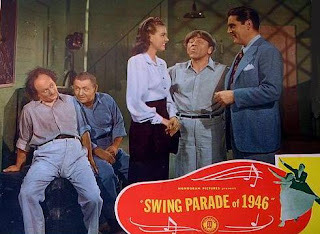 Swing Parade isn’t as strong as some of the other new Rifftrax DVDs because, quite simply, the movie being targeted isn’t all that bad—again, it’s no masterpiece, but it has its moments and the Stooges add some flavor. That complaint aside, the Rifftrax guys land some witty lines, and their commentary provides a nice compliment to the feature presentation. "Swing Parade," and several other Rifftrax DVDs, hit shelves on Tuesday, June 16th.